Chirpify is announcing that it’s scored $1.3 million in funding from an impressive array of investors, including Voyager Capital, HootSuite CEO Ryan Holmes, TiE Oregon Angels, BuddyTV CEO Andy Liu, investor Geoff Entress and former Facebook exec Rudy Gadre. The company is also launching its Twitter Commerce for Digital Content platform, that allows artists and musicians to sell digital content directly through Twitter. 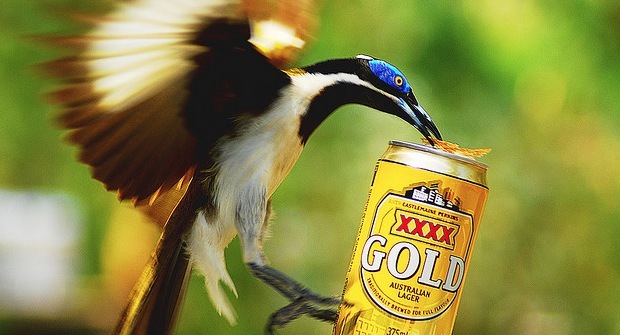 If you’re like me, you probably first heard of Chirpify through the brilliant ‘Tweet-a-Beer’ campaign during SXSW. The app, put together by Waggener Edstrom and TenFour, used Chirpify to ‘send someone a beer’ by basically tweeting them a couple of bucks with a message. The Portland, Oregon-based Chirpify uses a crisp in-stream transaction model that lets all of your transactions take place right in a Tweet. You can buy physical goods, sell things, donate to charities or pay someone for goods with one Tweet, it’s incredibly slick. In a demo of the Chirpify dashboard, which you use to send direct payments and set up things for sale, Tesso demonstrated the way that the payments work and the platform that the team has set up is so insanely simple that it defies belief. 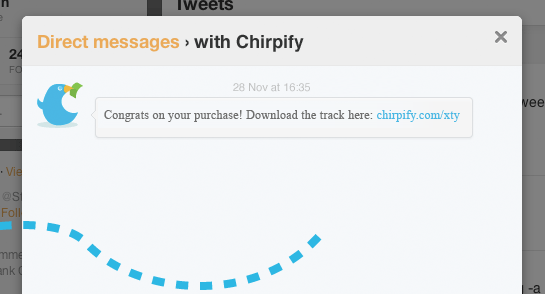 I’ve never used or seen a payment scheme as quick and easy as Chirpify. 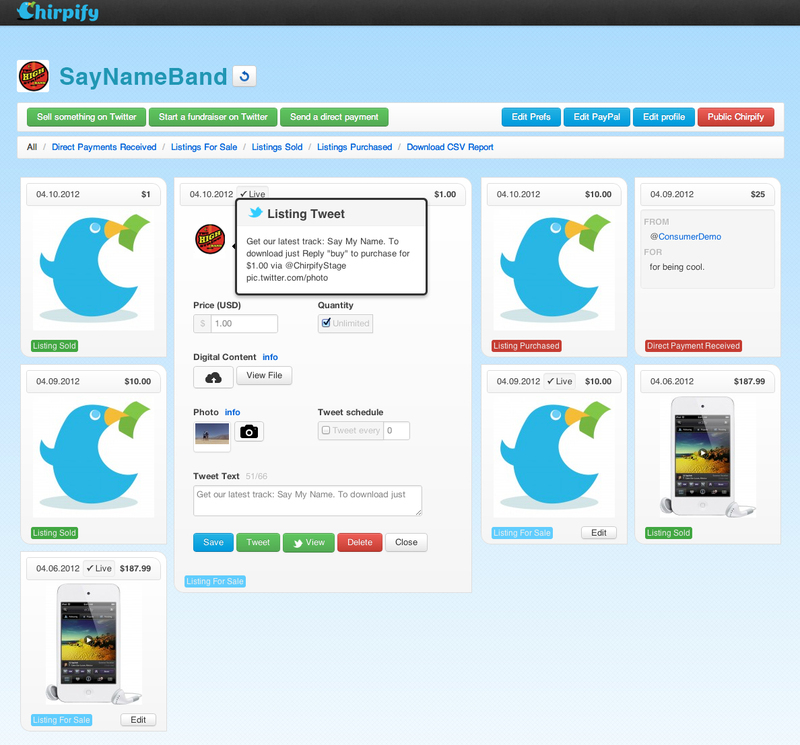 As is the case with a lot of new services, Chirpify’s early attention came from the use of its API, in this instance, via the Tweet-a-Beer campaign. That’s why Tesso says that Chirpify is committed to building that out as well, making it as attractive as possible for developers to build apps that can send and receive payments directly on Twitter. 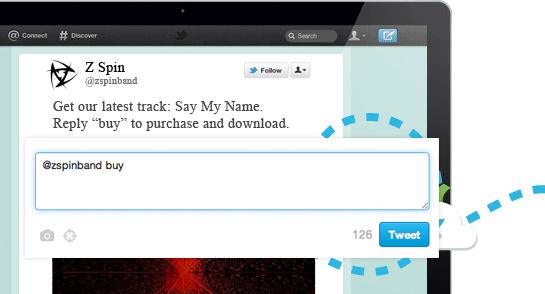 Some big brands, like HP and Powerbar, agree and have started using the platform to sell directly to Twitter followers. And the fact that the company only launched about 7 weeks ago and already has its first round of funding, from people who know the space well, is telling too. Chirpify uses Paypal as the backbone by which it processes payments, and integrates tightly with its system, so you should see payments nearly instantaneously. But, unless you’re the one selling things, you would probably never know that Paypal had anything at all to do with Chirpify’s service, because it’s all handled right in your Twitter feed. Today’s announcement isn’t just about the funding, though, Chirpify is also launching its platform for selling digital content, like song tracks and tickets. This is something that Tesso says they did not anticipate. But, after building the product out in order to facilitate easily selling things off of say, Craigslist, Tesso says that they saw a lot of people using it to sell digital content. Now, with the platform they’ve built, a musician can upload any track that they own the digital rights to and Tweet out a Chirpify listing with the price and link to the item. If a person replies back with ‘buy’, they get an instant DM with a link to the track, the artist gets their money and the user gets their music. It’s incredibly simple. The immediate potential is huge, especially for an artist that has a huge following on Twitter. Let’s say Justin Bieber records a track with his own cash and wants to drop it on Twitter tomorrow. How many of his 20 million followers do you think would sign up for Chirpify and Tweet back ‘buy’? What if he does it again, with many of them already signed up, how many tracks would he sell directly, with only PayPal fees taken out? With a lot of artists like Louis C.K., Jim Gaffigan and Aziz Ansari taking to the net with their $5 direct-sale digital-download specials, Chirpify feels like the right product at the right time. What’s to stop Twitter from becoming the next big direct-digital-sales platform? It’s a thought that I floated to Teso during our chat. Twitter is a huge platform, with a universal ID, an enormous user base, integrated digital content sharing and a well-developed ecosystem of third-party developers and apps. All that it is missing is an elegant payment system. How long until they see what Chirpify is doing and snap them up? Teso just laughed and said that they’re a young company and that they’re happy just getting the funds to start hiring sales and API talent to build out their new digital sales platform. The company is definitely young, but there is massive potential here, Chirpify will be an interesting company to watch.